In this report, Persistence Market Research (PMR) offers a ten year forecast of the global animal parasiticides market between 2016 and 2026. The current study reveals the market trends and market dynamics in all seven regions from world that are expected to positively affect the current market environment and future scenario of the animal parasiticides market over the forecast period. This PMR report inspects the global animal parasiticides market for the period 2016–2026. The prime objective of this report is to offer insights into developments in the animal parasiticides market that are gradually helping transform global businesses associated with the same. The global animal parasiticides market report begins by the executive summary and defining various categories and their usage in various industries. It is followed by market dynamics overview of the global animal parasiticides market, which includes PMR analysis of market trends, drivers, restraints and opportunities that are affecting growth of the global animal parasiticides market. It also covers a section summary with rationale for demand of animal parasiticides with value propositions in segment outlook. Furthermore, to understand the popularity of the market segment and regions, the attractiveness index with elaborated insights on the same is provided, which will show the market’s attractiveness based on factors such as CAGR and incremental $ opportunity. Based on product type, the global animal parasiticides market is categorised into Ectoparasiticides, Endoparasiticides and Endectocides. Among the aforesaid product type segments, Endectocides segment is expected to exhibit the highest CAGR followed by Endoparasiticides segment. In the growth of the Endoparasiticides segment, the sub-segments such as oral liquid, oral solid, injectables, feed additives and other Endectocides plays a vital role. On the basis of animal type, the global animal parasiticides market is segmented into food producing animals and companion animals segments. Among the animal type, the food producing animal segment is contributing the highest market share in terms of value over the forecast period. Based on the distribution channel, the global animal parasiticides market is segmented into veterinary hospitals, veterinary clinics and pharmacies and drug stores. Among the distribution channel segments, pharmacies and drug stores contributed leading shares in terms of value to the market over the forecast period. The next section of the report highlights the global animal parasiticides market, by region, and provides the market outlook for 2016–2026. The study investigates the country trends contributing to the growth of the global animal parasiticides market and the market attractiveness region wise, as well as analyses the limit to which the drivers are influencing the global animal parasiticides market world over. Regions assessed in this report include Western Europe, North America, Latin America, Eastern Europe, Asia Pacific (APEJ), Japan and Middle East and Africa (MEA). The above sections, by product type, by animal type, by distribution channel and region, evaluate the present scenario and growth prospects of the global animal parasiticides market for 2016–2026. In the final section of the report on global animal parasiticides, the ‘dashboard view’ of the companies is provided to compare the current industrial scenario and their contribution in total animal parasiticides market. Moreover, it is primarily designed to provide clients with an objective and detailed comparative assessment of key providers specific to a market segment. Report audiences can gain segment-specific manufacturer insights to identify and evaluate key competitors based on the in-depth assessment of their capabilities and success in the animal parasiticides marketplace. Detailed profiles of animal parasiticides manufacturing and processing companies are also included in the report to evaluate their long– and short–term strategies, key product offerings and recent developments in the animal parasiticides market. Key market players covered in the report include Sanofi S.A. (Merial), Ceva Sante Animlae, Virbac SA, Vetoquinol S.A., Eli Lilly and Company, Zoetis Inc., Merck & Co Inc., Bayer AG, Boehringer Ingelheim GmbH and Perrigo Co. plc. To ascertain the global animal parasiticides market size, we have taken into account the revenue generated by the various animal parasiticides manufacturers and processors globally. The forecast presented here assesses the total revenue generated by value, across the global animal parasiticides market. In order to provide an accurate forecast, we initiated by sizing up the current market, which forms the basis on how the animal parasiticides market is expected to develop in the future. Given the characteristics of the market, we triangulated the outcome on the basis of three different types of analysis; based on supply side, downstream industry demand and the economic envelope. In addition, it is imperative to note that in an ever-fluctuating global economy, we not only conduct forecasts in terms of CAGR, but also analyze the market based on key parameters, such as year-on-year (Y-o-Y) growth rates, to understand the predictability of the global animal parasiticides market and identify the right opportunities across the market. The animal parasiticides market, by product type, by animal type, by distribution channel type and region, have been analyzed in terms of basis point share (BPS) to understand the individual segment’s relative contributions to market growth. This detailed level of information is important for identifying various key trends in the global animal parasiticides market. Another key feature of this report is the analysis of key segments in terms of absolute dollar opportunity. This is overlooked while forecasting the market. However, absolute dollar opportunity is critical for evaluating the scope of opportunity that a provider can look to achieve, as well as to identify potential resources from a delivery perspective of the global animal parasiticides market. The overall absolute dollar opportunity along with the segmental split is mentioned in the report. To understand key growth segments in terms of growth and adoption for animal parasiticides globally, PMR has developed the animal parasiticides market ‘Attractiveness Index.’ The resulting index should help providers identify real market opportunities. Animal parasiticides are chemical substances that eradicate parasites other than fungi and bacteria in animal livestock, pets and other animals. These are generally inert ingredients made in a formulation and consist of one or more than one active ingredients. Most parasiticidal active ingredients have similar chemical structures and share many features. They are often grouped into chemical classes or families. The importance of the animal parasiticides has been recognized for the protection and cure of the parasitic diseases in animals. Companies are coming with the various new formulations and products in the animal parasiticides market to eradicate the increasing prevalence of foodborne diseases. A growing awareness about animal healthcare, rapidly growing animal livestock and technological advancements over the past few years are expected to boost the growth of the global animal parasiticides market. Increasing animal livestock population and a growth in the adoption of the companion animals over the past few years globally are factors responsible for a significant growth in the animal parasiticides market. 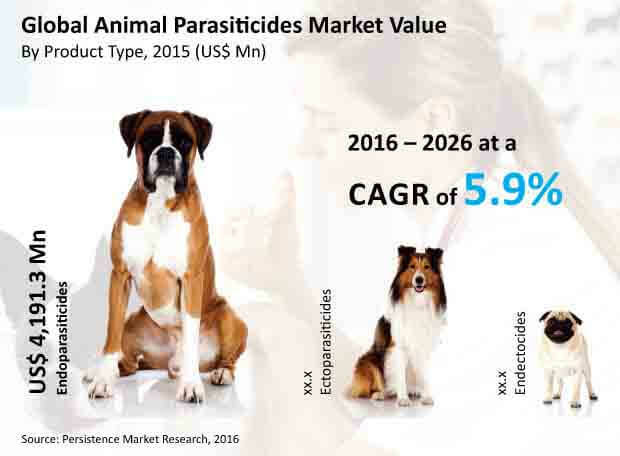 The global animal parasiticides market has registered a value of US$ 6,976.2 Mn in 2015 and is anticipated to reach a value of US$ 13,064.7 Mn by 2026 with the projected CAGR of 5.9% during the forecast period (2015–2026). The global animal parasiticides market is projected to register a significant growth over the forecast period due to the increasing awareness about animal healthcare worldwide. Besides, escalating number of livestock animals for the purpose of food production in emerging economies is leading to a rising demand of animal healthcare products, which also drives the growth of the global animal parasiticides market. An increase in the animal healthcare expenditure for animal welfare to improve the health of livestock animals is further fuelling the overall animal parasiticides market. Furthermore, increasing adoption of companion animals in the developed economies also anticipated to positively influence the animal parasiticides market. However, a growing preference for vegetarian food and diet and a stringent approval process for animal parasiticides coupled with restrictions on the use of parasiticides in food producing animals are the restraints affecting the global animal parasiticides market. The animal parasiticides market is segmented into Ectoparasiticides, Endoparasiticides and Endectocides. The Endoparasiticides segment is expected to lead the revenue market share over the Ectoparasiticides and Endectocides segment. Demand of the Endoparasiticides is more as they control an increasing prevalence of internal parasiticides such as roundworms, tapeworms and flukes which in turn fuels the Endoparasiticides segment growth. Furthermore, the restrictions on the use of parasiticides in food producing animals may restrain the growth of Endoparasiticides and Ectoparasiticides segment over the forecast period. The global animal parasiticides market has been segmented into the seven prominent regions namely, Western Europe, North America, Latin America, Eastern Europe, Asia Pacific (APEJ), Japan and Middle East and Africa (MEA). The Western Europe market is leading in terms of revenue generated in the global animal parasiticides market due to high awareness about animal healthcare and high healthcare expenditure for animal welfare, and is expected to register a CAGR of 6.2% over a forecast period. North America and APEJ regions have also registered a decent growth in the global animal parasiticides market and are expected to contribute a healthy share in terms of value over the forecast period. Latin America and MEA regions are at a nascent stage in the global animal parasiticides market and are anticipated to contribute a decent market revenue to the global animal parasiticides market over the forecast period. Some of the major players in the global animal parasiticides market that are covered in this report are Sanofi S.A. (Merial), Ceva Sante Animlae, Virbac SA, Vetoquinol S.A., Eli Lilly and Company, Zoetis Inc., Merck & Co Inc., Bayer AG, Boehringer Ingelheim GmbH and Perrigo Co. plc. The report also describes company-specific strategies related to key developments and market consolidation initiatives.